The Galaxy C9 Pro has a massive 6” screen with a FHD display (not QHD, considering the price) and a matte metal finish back with antenna lines being visible for the first time on a Galaxy device. Thankfully they are not grooves but blend in with the metal looking like a fancy Samsung device in Stealth mode! It’s pretty heavy at 190 gms and you feel that when it’s in your pocket, and single hand usage will be a challenge. 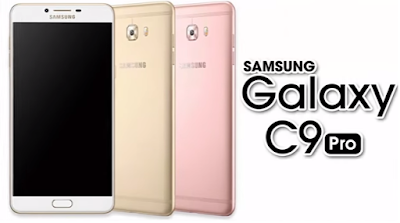 Available only in Gold and Black colors it supports Dual Sim 4G, dual band WiFi and VoLTE. Surprisingly, it’s not water or dust proof! On the front you also have the 16MP camera at the top and a fingerprint scanner/home button at the bottom flanked by capacitive buttons. The 3.5mm jack and speaker are at the bottom edge with the fast charging Type C port between them. In usual Samsung design language, volume buttons on the left and Power button on the right. Also on the right are the Dual SIM slots and the Micro SD card slot. In terms of ergonomics, it’s a compact phablet and won’t make you look awkward while being on a phone call when the phone’s slapped on your face! Samsung has powered the C9 Pro with the Octa-core Snapdragon 653 paired with Adreno 401 and the USP of the device being the 6GB RAM with 64GB memory. It supports Micro SD cards upto 256GB. To run all this set up, a 4000 mAh battery would be a minimum and Samsung provides that with quick charging support and a fast charger. Both front and rear cameras have the 16MP setup with f/1.9 , not something you see in most phones. Your selfies will just be as good as your rear camera pics and that’s a bonus! There’s very less noise in low light photos thanks to the dual flash and improved camera software. You have the usual shooting modes and effects with more available to purchase via the Galaxy store. It’s great at focussing and details come out well, Bokeh effect photos will blow your mind! Disappointingly there’s no 4K video recording and 1080p videos are at 60fps. Getting Android 7.0 out of the box is what you’d expect but C9 Pro disappoints with 6.1, though the Touchwiz UI on top is now smoother and with less bloatware. You have the Always-On display mode like in S7 to see notifications, time etc. without turning the screen on. Other add ons include Blue light mode, game mode, easy UI mode, Secure folder to protect your data, Samsung Notes, S Health and a few other from the S7/Note basket of apps. For Multimedia the earpiece doubles up as a speaker though it’s not as powerful as the speaker at the bottom. Gaming and multitasking is something you don’t have to worry about thanks to the 6GB of RAM. All of this squeezes the battery out but you still get over a day’s usage easily. It’s competing with the One Plus 3T, Moto Z and Huawei P9 but they are still better devices overall. No 4K recording, Nougat yet to be delivered and a price which is marginally lower than the S7 it doesn’t cut it. S8 in a month will see price drops so hold on till then!